“Okay Folks, this guy Clyde is anything but a conventional kitty. So you won’t be surprised that I spied Clyde driving a 1952 Chevy Woodie (you know, one of those old station wagons with real wood paneling on the sides) in my very neighborhood the other day. That’s right, he was sputtering down Sunset Boulevard at The Cove in Seaside. And yup, he had a surfboard tied on top of that Woodie. Clyde was about to ride a few waves, and if I know Clyde, he probably was hoping to dodge a few sharks while doing it. Take in that visual image, if you will, and you’ll pretty much know what kind of cat this three year old is. He’s a feisty adolescent male. The guy’s adventuresome, always ready for action. So much so, he might just start a small skirmish with another cat simply for something to do. Clyde’s not the cat for just anyone. You couch potatoes best find yourself a lap cat, not a surfer cat like Clyde. 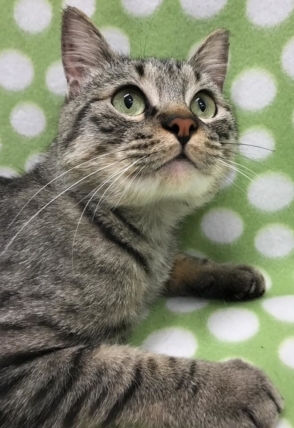 But if you, yourself, are into daring action and morning to night fun, then this cat Clyde just might be the one.